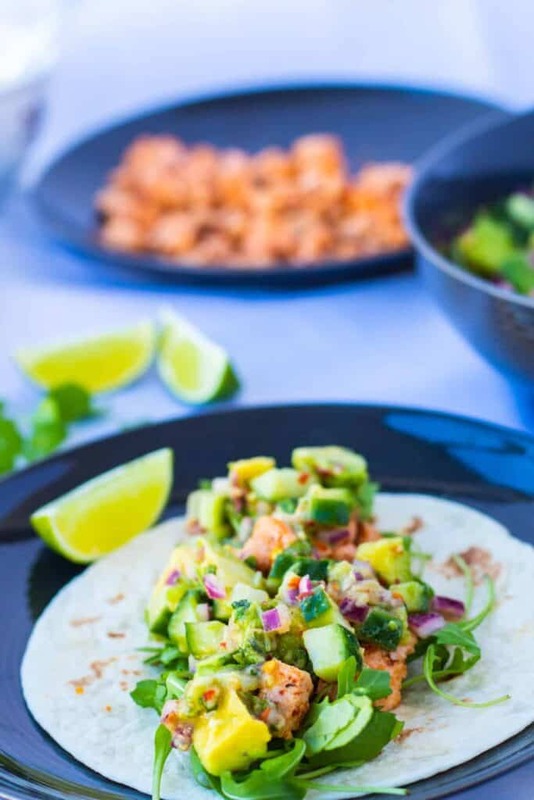 Healthy salmon is seasoned lightly, pan-fried quickly, and deliciously paired with a super easy Ginger Avocado Salsa to make the perfect healthy Salmon Tacos. All with just a few short minutes of cooking, loads of health benefits and even more taste! Tacos. Tacos tacos tacos. I have a slight taco problem and I make some kind of taco at least once a week. That’s why I try my best to come up with versions that are a bit better for you. 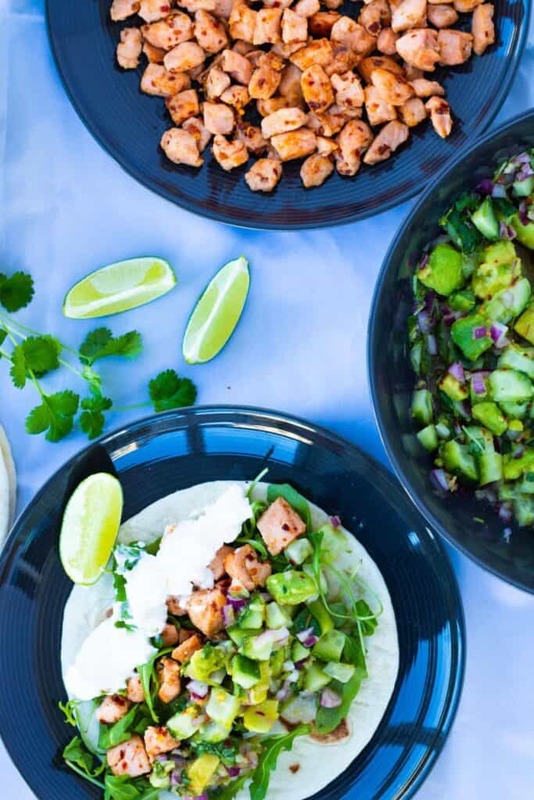 Either by making them vegetarian (like the perfect Buffalo Cauliflower Tacos) or by exchanging all the not-so-healthy-stuff for all of the good stuff, like for these salmon tacos. Are Salmon Tacos Good For You? Salmon tacos can be a great healthy choice – just as long as you choose the right way of preparing them, and the right condiments. Read on to get my suggestions for how to do just this! 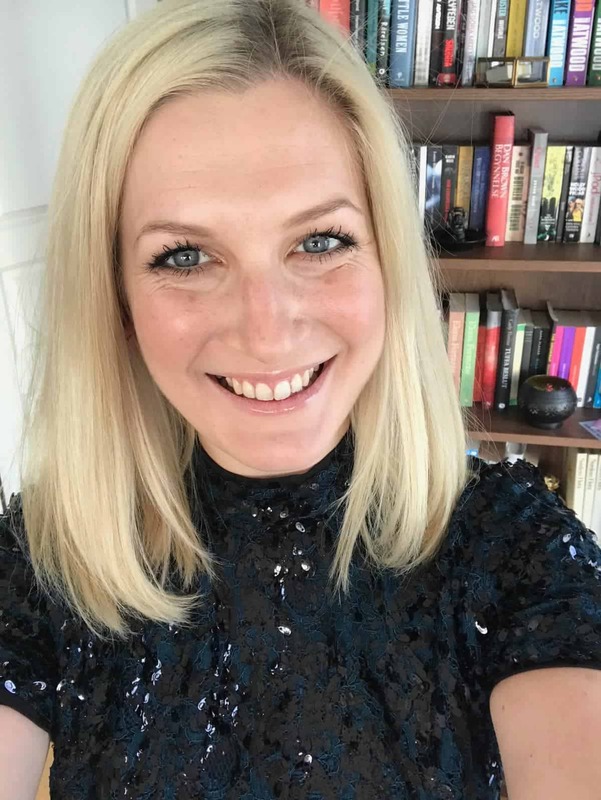 Salmon in and of itself is generally very good for you, and it contains several vital substances that are often hard to get enough off through just food. So adding a bit more salmon to your diet might be just what you need! Most people are aware of the loads of Omega 3 in salmon. But salmon also contains a lot of Vitamin D, and most of the important Vitamin B’s as well. 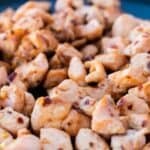 It’s also full of protein, and therefore great to eat if you’re on a pescatarian diet and staying away from meat. If you want to know more about the health benefits of salmon, this article comes up with a full 11 health benefits of eating salmon. Many fish taco recipes call for deep-frying the fish. As with all deep-frying, it’s both delicious and not all that good for you. So by all means, go ahead and deep-fry your fish once in a while. But for those every day, more health-focused meals, make this healthy pan-fried no-batter version instead. A great thing about fish tacos is that they lend themselves so well to healthy toppings. While I rarely enjoy my meat or chicken tacos without loads of cheese on top (I’m talking LOADS! 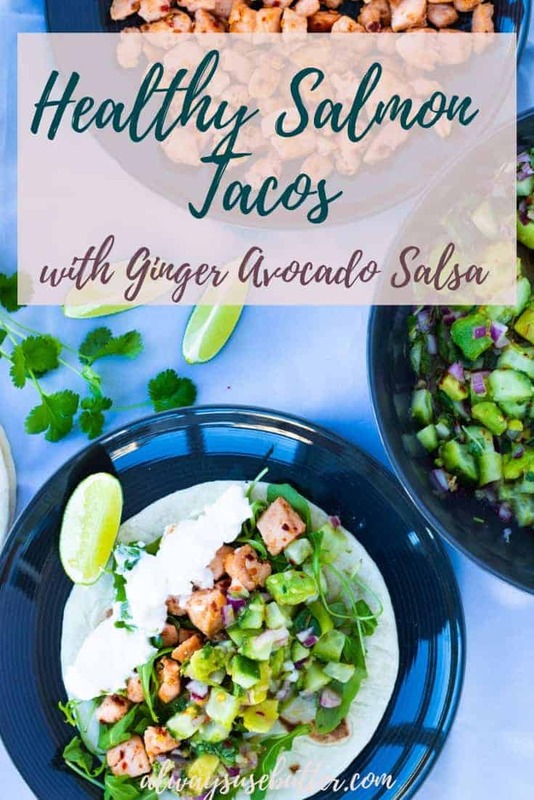 ), when I have fish tacos in general – and these healthy salmon tacos in particular – I’d much rather pair them with a nice, chunky and flavorful salsa and some leafy greens. And maybe some greek yoghurt, just to get that creaminess. OK, time to talk about this particular recipe. 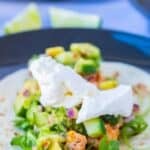 These salmon tacos are super quick to make, and I bet when you’ve tried them once you will soon make them again. The first step is to chop up your salmon nicely, season it with salt and chili flakes and mix well. Then set it aside for at least 10 minutes to absorb the flavors before cooking. Let it sit longer if you like, but decrease the amount of salt a bit if you do. 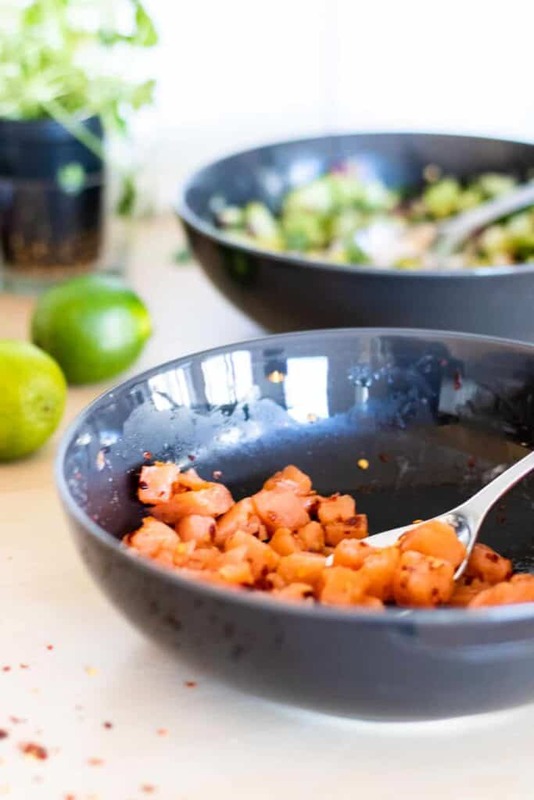 In the mean time – make the salsa, and then, just before serving, fry the salmon for a few minutes in a mix of butter and oil. Cook through if you like, or leave a pink center. 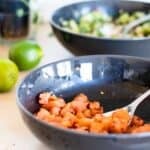 Making the ginger avocado salsa is almost as simple as making the salmon. There’s just a bit more chopping involved. But once you’ve chopped and grated everything, just mix it and season according to taste. Let sit for a few minutes to let the flavors set, and then serve. Easy, right?! When you have your salmon fried and your ginger avocado salsa done, time has come to enjoy all this deliciousness. 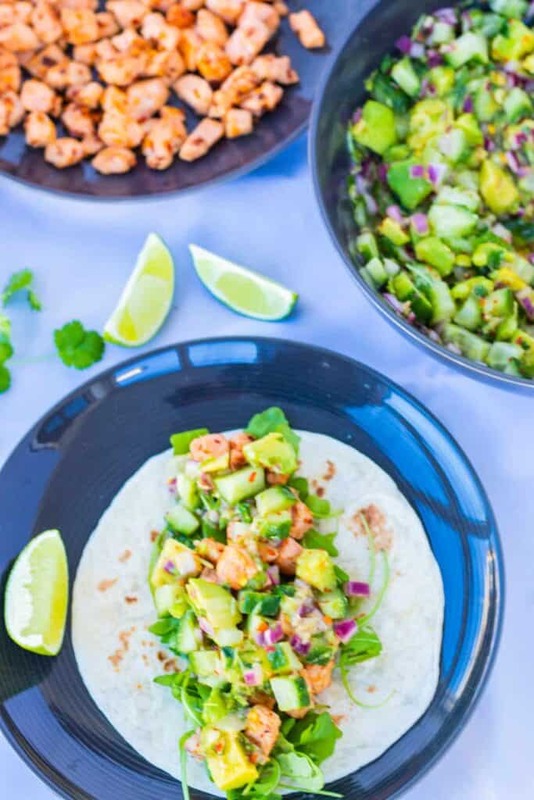 Grab a tortilla, add some leafy greens (I like arugula for some pepperiness, but baby spinach is also a great choice), add some salmon and top with a generous helping of ginger avocado salsa. Maybe add dollop of greek yoghurt, and serve with a lime wedge to squeeze as you please. What’s your favorite way to eat Salmon Tacos? I’d love to hear in the comments below! Did you try this? Rate it and leave a comment, and let me know what you thought! And if you post about it anywhere – please tag me @alwaysusebutter and use the hashtag #alwaysusebutter! 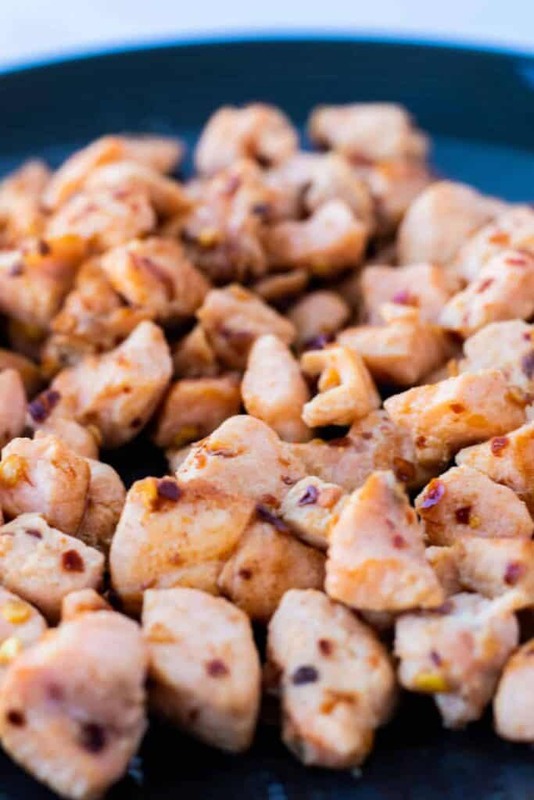 Mix the salmon with the chili flakes and salt. Set aside to let the flavors set, for about 10 minutes. Meanwhile, make the salsa. Mix all the ingredients in a bowl, taste test and adjust the seasoning accordingly. Set aside to rest for at least 10 minutes. When the salmon has rested for 10 minutes, heat a pan over medium-high heat an add in the vegetable oil and butter. When hot, add in the salmon and fry for a few minutes until cooked on all sides. Cook all the way through (about 2 minutes) or leave a pink center, depending on your preferences. Make the tacos by taking a tortilla and placing arugula or other leafy greens and the cooked salmon on top. Top with the ginger avocado salsa and greek yoghurt. Serve with a lime wedge on the side. If you don’t like spice – start with half the amount of chili flakes. I am not a fan of salmon, but if you stick it in a taco, I am sure to try and eat it!! This looks so good. My husband would LOVE these salmon tacos. Yum! I love salmon, but never thought of putting it in tacos! It looks so fresh and delicious, thanks for sharing! You are very welcome, Carrie! And thank you so much for commenting! I love fish tacos, but I always make them with some sort of white fish! How silly of me not to think to use salmon! I have two beautiful salmon filets in my freezer that I need to cook soon! Will definitely be trying this recipe! Also, that avocado salsa should win some sort of award! Holy moly! It looks so good! Thank you so much for your comment, Krista! Yeah, that seems to be the common way to make them – but I just love making them with salmon. So much flavor in there already so no need for deep-frying. Hope you try it! 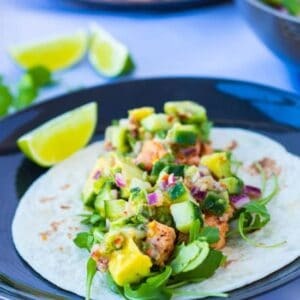 I love salmon tacos with a nice mango and avocado salsa. Perfect summer food! I absolutely love salmon but I have never thought of a salmon taco! What a fab idea, I will have to give this recipe a try! Thank you, Sarah! Please do, such a great combo of healthy & indulgent! I love how easy this is and how quick you can put this together! It’s a keeper. Thank you, Farwin! Let me know if you try it! 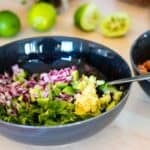 The avocado salsa sounds so good! I love the touch of honey for some sweetness with the heat! The salmon to salsa ratio looks perfect! Salmon is my perfect food. And I never get tired of making it and trying various recipes. I NEED to try yours now because it looks delicious! And I bet it tastes even better! Thank you, April! I’m a huge salmon fan as well! But this might just be my favorite way of having it. 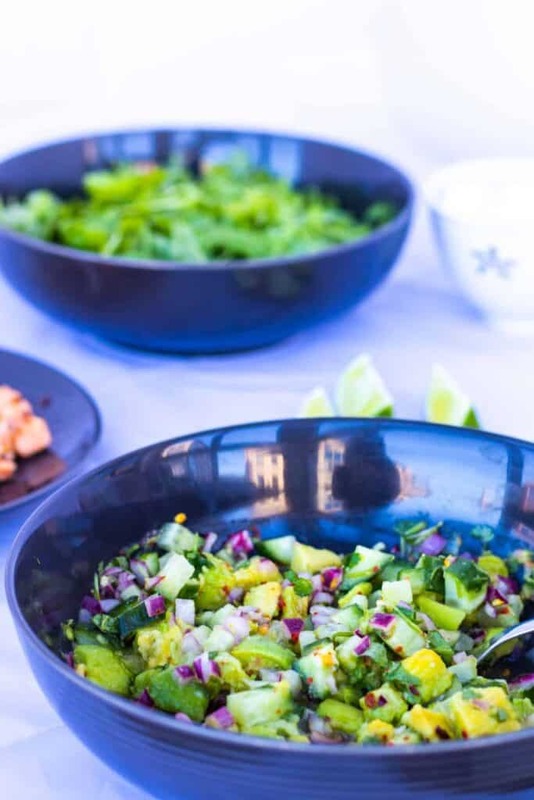 That ginger avocado salsa sounds just wonderful – great flavors! This is a great idea for a healthy weeknight meal. Thank you, Danielle! I love it just as you said, as a healthy (and quick!) weeknight meal. Thank you for commenting! Yeah it’s really a light & nice meal. YUM! I love salmon! That salsa looks sooooo amazing. Salmon and Tacos- two of my favorite words together! Pinning! These look amazing! I’m trying to get my kids to eat more fish. It really is a headache though because they never seem to like the flavor. 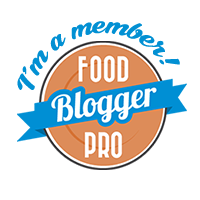 You have a different flavor profile then what I have tried with them though so I’ll have to give your recipe a try. If they don’t like it I know that I will! Thank you, Kristen! That sounds like a great idea – let me know what they think! This looks so delicious! 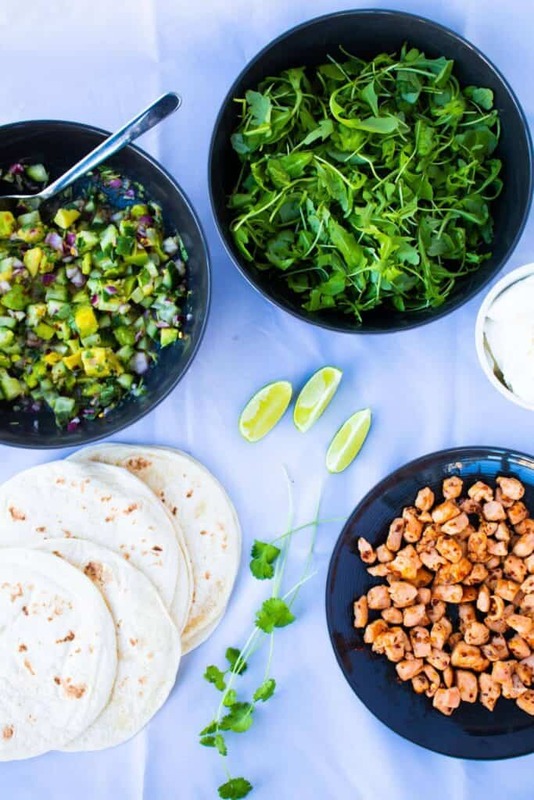 The ginger avocado salsa sounds like such a perfect combo of tastes. I can’t wait to try it! salsa sounds so good! just wonderful and great flavors. 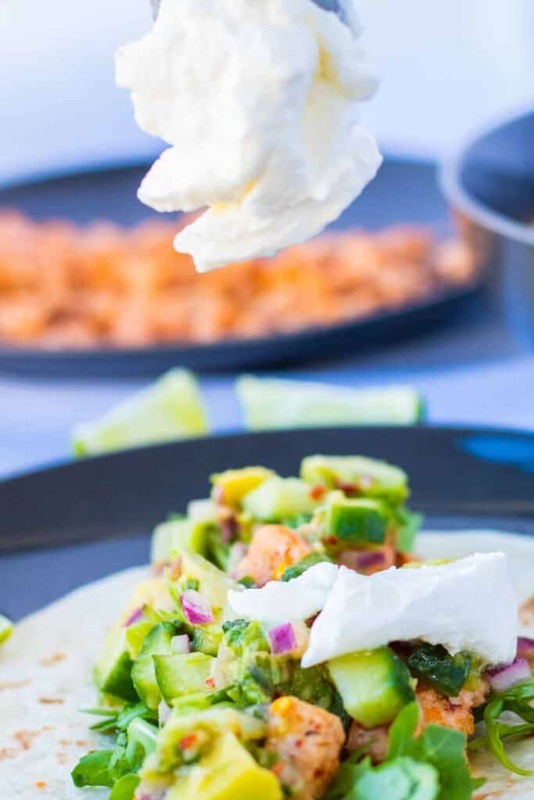 This salmon taco recipe looks absolutely delicious. I love that it uses limes because the lime juice always takes an ordinary taco to the next level. Thank you Elle! Totally agree! Yesss these look too good! I want to make them 🙂 And quite easy, too! Great combo putting ginger and avocado together. This looks so appetizing, I’m in love with avocados so much that i made a wish that it shouldn’t be just seasonal. Thank you, Geraline! Yeah I agree – why can’t it always be avocado season?! That was such a healthy dish. I love salmons, i would definitely love anything with it. Thank you, Diana! I love salmon too! Such a versatile protein. 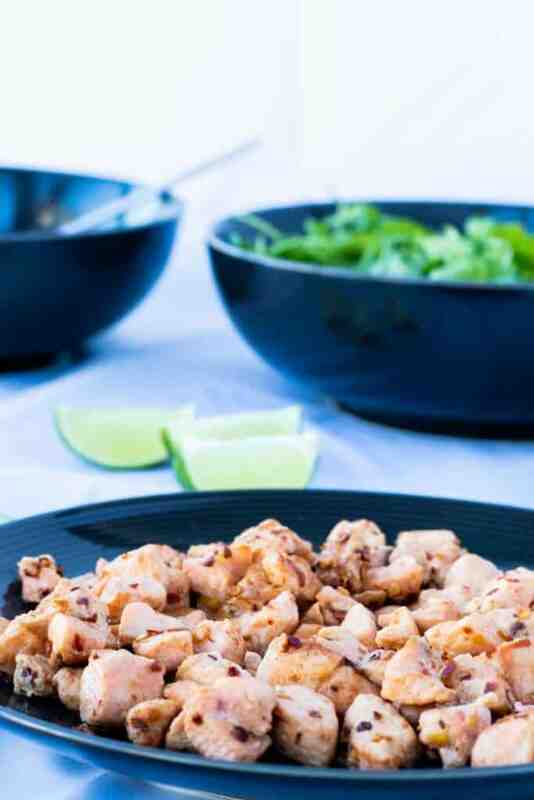 Fish tacos taste awesome and this recipe is just too yum! Loved it. It’s simple and can be prepared in such a short time. The pictures are also tempting. Thanks. First of all your set up is beautiful. I love salmon but never try salmon salmon taco. Time to get busy in the kitchen. Thank you sooo much! Salmon tacos might be one of the best ways to eat salmon, for me. Hope you try it! I love salmons. This tacos sounds like a good one. I will try this as soon as possible. Wow! Your photos are really crisp and this is super easy to follow along with. I will pass this along to my friends that love avocado. topic but I simply needed to ask. Thanks! Hey! Well that depends on how much work you are willing to put into it 🙂 I spend a lot of time on it but I also post new recipes at least twice a week. No programming skills needed though – it’s east to start on WordPress. 🙂 Good luck!